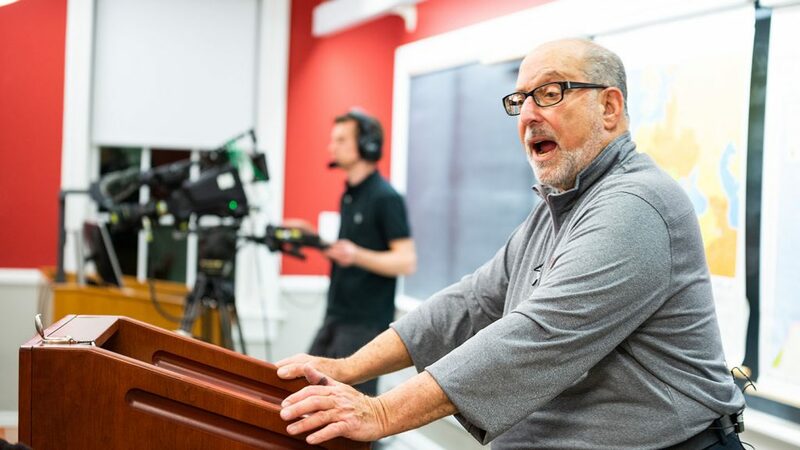 When Robert Weiner, professor of history, first arrived at Lafayette at the age of 26, he was the second youngest faculty member, and the College was an all-male institution. Fifty years later, Weiner, who plans to retire in May, reflects on a golden teaching career. Bob Weiner has remained active on campus in his last semester. Most recently, he gave a lecture on Feb. 27 on the origins of World War II, which was filmed by the nonprofit cable and satellite television network C-SPAN. In his junior year, while a student at both Temple University and Gratz Hebrew College, Weiner made his decision to become an educator. Before this decision, he was on a “dual track” to pursue either academia or rabbinic school. Weiner remembers being fascinated by history as far back as age 10. He credits his historic sensibility to his father, who used to talk to him about history and his World War II experiences. “My dad had basically taught me so much about so many things that in elementary school I was sometimes referred to as the human dictionary,” he says. Weiner was hired at Lafayette by Al Gendebien ’34, head of the history department at that time. “He became my second father,” Weiner says. Gendebien asked Weiner to teach Modern Jewish History, a first at the College. The two also obtained a grant from the Foundation for Jewish Culture in New York with the help of Rabbi Arthur Hertzberg, which funded the first Hebrew language course in recent memory at Lafayette, Weiner says. As a seven-time recipient of the Student Government Superior Teaching Award and 2009 winner of the James E. Lennertz Prize for exceptional teaching and mentoring among other awards, Weiner has gone above and beyond to connect with his students. Weiner also has been an integral figure in the development of the College’s Hillel Society throughout his 50 years, serving as both a director and the Jewish Chaplain for the society. Sydney Edelson ’19, acting co-president of Hillel, describes Weiner as a “walking advocate” for Hillel members. In Hillel Society’s early years, Weiner was a key proponent for creation of Hillel House, established on campus three years after he came to Lafayette. At Lafayette, Weiner taught in areas like European history and Jewish history. In 2005, Weiner published a series of lectures titled “The Long Nineteenth Century” with The Teaching Company. He also co-wrote with history department colleague Richard Sharpless the oral history An Uncertain Future: Voices of a French Jewish Community, published in 2012. Lafayette students are not Weiner’s only audience. He has built a YouTube following as well; his online lectures have generated about 150,000 views. His most popular one, “The Origins of World War II,” has been watched nearly 90,000 times. “I’m glad that people get a chance to listen to what I think,” he says. Following his retirement, Weiner says he will be spending half of his time in Florida and visiting more with his grandchildren. He says he will most miss his students, colleagues, and his office in Ramer History House.